The steps in front of your building may seem like a simple, functional detail. In fact, you may not give them much thought at all. But with the right hardscaping, you can construct a strong, appealing set of front steps that will stand up to years of weathering and use. Make sure your hardscaping is up to the task. Old, cracked, and worn front steps can send the wrong message to potential customers and clients. Consider a durable concrete front step to boost appeal. Patios are a great way to use your landscaping, as they can provide your business with a charming, inviting spot to enjoy your decorative landscape or to simply sit and stay a while. Make sure your customers feel welcomed and valued during their visit! A patio paired with a decorative landscaping wall can create a little oasis for customers to gather and enjoy the grounds of your business. Customers who feel welcomed will be more likely to return. Finally, walkways can be a great way to send a message with hardscaping. Whether you want to design a custom concrete walkway, brick sidewalk, or a natural stone path through your landscaping, your masonry professional can create the perfect walkway for your business. 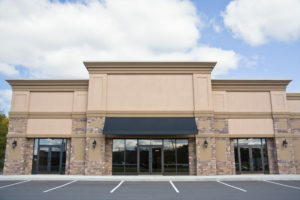 This can go a long way to making your business’s grounds look more appealing, boosting your property value and setting your business apart from the rest of the neighborhood. You can even carry your unique brand through the design of your hardscaping to draw in customer attention and catch the eye of potential customers passing by. This entry was posted on Friday, February 8th, 2019	at 2:34 pm	and is filed under Blog	. You can follow any responses to this entry through the RSS 2.0	feed. Both comments and pings are currently closed.